OBSOLETE: soapi.info has been down since at least 2012. 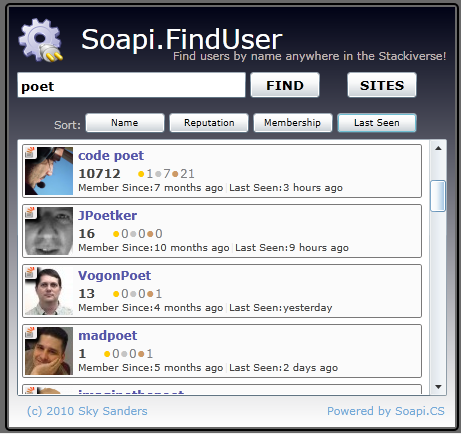 Soapi.FindUser (silverlight) is provides a means to quickly find any user anywhere is the Stackiverse. You may search any number of Stack Exchange sites. A click on an item will open the profile page for the user in question. Soapi.FindUser is free to use and is licensed under GPL V2. Soapi.FindUser was hosted at http://soapi.info/findusers.aspx (not available anymore). Any platform/browser that supports Silverlight 3. This includes Windows and MacOS. A Windows Phone 7 version will be forthcoming. Soapi.FindUser was created by code poet. Soapi.FindUser (silverlight) was written in C# using Visual Studio 2008 for use as a reference implementation using Soapi.CS and the full source is included in the Soapi.CS source repository. This application is also a demonstration of how to use the common API related controls in Soapi.Contrib.Silverlight. This app uses the UserListViewItem and SiteSelector controls. As is the case with any application written using Soapi for api access, the code needed to get the data you want from the API is the least amount of code you have to write and by far the easiest to understand. //  Licensed under the GPL Version 2 license. Uh, I hate to say this, but this does not work on Ubuntu. I have MoonLight installed, but it doesn't show anything in Firefox or Chrome. It displays the loading circle for a few seconds and then displays a blank page. Not the answer you're looking for? Browse other questions tagged app obsolete soapi.cs silverlight . Where can I find the reputation black market? Exterminators - Bugs and Features, Present and Past and those who brought them to light.